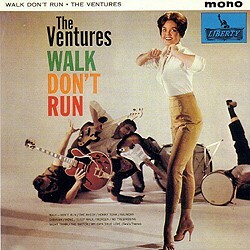 Not exactly a reflection of the gritty image held out by the title, The Ventures’ earliest cover of this minor instro classic cruises along effortlessly with some fine lead work from Bob Bogle and decidedly listen-to-me bass contribution from Nokie Edwards, for me preferable by far to the arty Sir Douglas Quintet-styled version on the 1970 LP More Golden Greats. While the group’s latest re-recording for this new millennium is not short on drive and boasts some vibrant Edwards’ guitar (V-Gold II, Japan 2000), the bass is a bit on the boomy side, particularly at high volume levels. In fact, on The (deputy) Ventures’ 1972 LP Rock And Roll Forever (see under ), the combination of Harvey Mandel’s guitar, Jackie Kelso’s sax and David Carr’s piano strikes me as a winning one for this particular number, mirroring as it does much of its archaic charm. 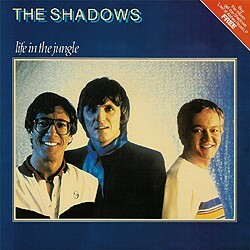 The super-smooth Shadows version of the 80s, the closing track, and the weakest, on Life In The Jungle, is just too sterile.